Friday’s 10 Happy Things is a blog link-up by Helga. Here, we list the things that made us smile (or even laugh). We lost Sanji’s yaya this week because she had to go home to her own children. If you’re a mom or a home maker, you’d know how tough it is to find good household help, let alone a good nanny. 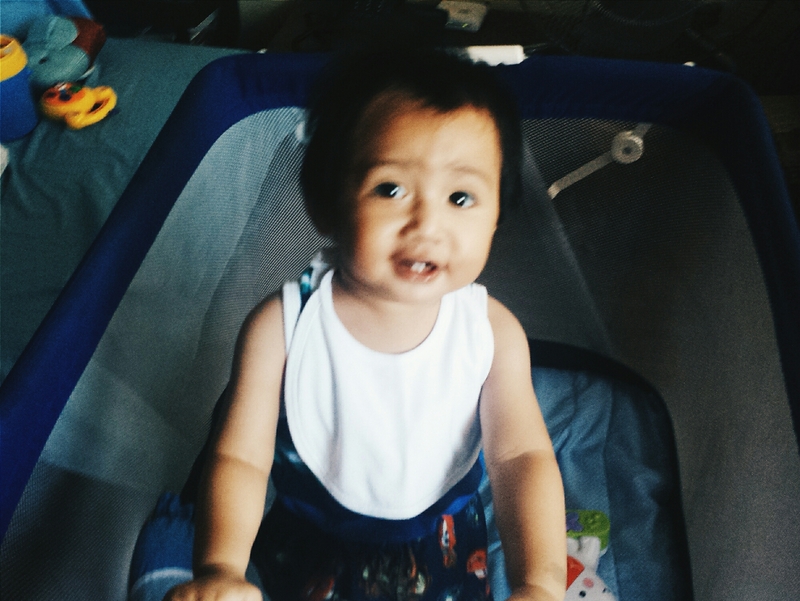 But iz okay, because I get to spend more time with ze litol cutie! Accomplishing tasks as work. We’re building a platform and I got to do it in Python. Which I absolutely LOVE using. I’m new to it, so each day is like a geeky coding treasure hunt. Taking one day off from work to babysit Sanji. That day was the highlight of my week because we got to play, watch (Peppa Pig is his favorite nowadays), and eat! We rolled around our bed, and got lots of tickle time and peek-a-boos. Mom’s cooking. OH GOD veggies in cream sauce with quail eggs, chicken porridge, fish sticks! She cooked molo soup today, my (and dad’s) absolute favorite soup dish. I can eat a potful in one sitting. Claiming my winnings from The Body Shop x The Misty Mom #RemoveYourMakeupMovement. I may do a run through of the stuff for that if I have the time. Celebrating our little man’s 11th month yesterday. He liked the cheese cake from Kumori so much, that he ate half of my share. That kid has a large appetite. Swatching and shooting lipsticks for my next lipstick arsenal post. It’s kind of nice to not think about programming, even for a little while. Book conversations with a co-worker. It’s very rare that I get to have these talks, because people sometimes get weirded out. She introduced me to JJ Abrams’ multi-fiction layered book called S, and I introduced her to Neil Gaiman’s graphic novel, Neverwhere. Good talk. Sanji being more makulit and malikot. He babbles a lot too! When he doesn’t like something he’d blurt out a “Aaaahhhyyy” and when I’d say buh-bye, he’d scream “Mama!”. My wanting to be a stay at home mom grows more and more each day. That’s all folks! I hope you had a wonderful week with your loved ones! there’s just a few things I know about HTML and I wanna learn more geeky coding but I don’t know where to start! Lelz Also, Sanji’s a really kawaii name! HOW WAS KUMORI! We might work with them but I haven't been in Landmark/SM Makati so I haven't tried their stuff! I want cheesecake now.